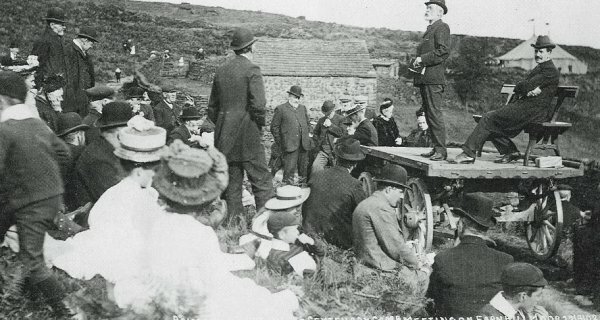 Camp Meetings -- Under the auspices of the Bradford and Halifax and District Centenary committee of the Primitive Methodist Chapel, two camp meetings were held on Farnhill Moor. About 500 persons assembled at Kildwick and formed a procession, under the conductorship of the Rev. F.W. Shirtcliffe, of Howarth, and marched through the village to Farnhill Moor. The afternoon service was presided over by the Rev. A Jubb, of Bingley, and the preachers were Mr. F.H. Healis, Skipton, and the Rev. J Dodd, Keighley. As the evening service was proceeding rain commenced to fall, which made it necessary to adjourn to a marquee which had been erected for the purpose of serving refreshments. The service was conducted by the Rev. W J Robson, of Silsden, and the preachers were the Rev. C C Goodall, Skipton, and Mr. W. Bennett, Keighley. Collections were taken for the centenary fund. The History Group archive includes a photograph, of a previous outdoor meeting held on Farnhill Moor in 1902. Notice the large marquee in the background.